North Carolina has been a leader in the maternal and child health (MCH) arena for decades. From the synergy of multiple efforts, the Women’s Health Branch, Division of Public Health, Department of Health and Human Services (DHHS) convened a group of partners to draft a statewide plan to include a focus on infant mortality, maternal health, maternal mortality, and the health status of women and men of childbearing age. 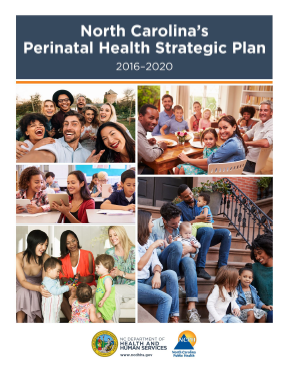 The Perinatal Health Strategic Plan (PDF, 12.1 MB; HTML) was released on March 24, 2016 by the DHHS Secretary and Deputy Secretary. This plan includes feedback from over 150 thought leaders throughout the state. To get involved or to ask questions, send email requests to the Branch. A positive urine, meconium, or umbilical cord segment substance test with provider concerns. 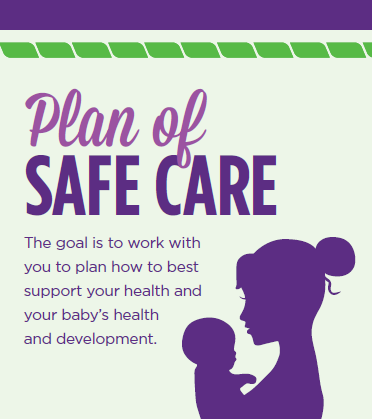 This law also requires that a Plan of Safe Care (POSC) is developed for these infants. The POSC English (PDF, 2 MB) and Spanish (PDF, 2 MB) pamphlets provide basic information for patients regarding how and why a Plan of Safe Care is created. Agencies should download the brochures as needed. The Women's Health Branch (N.C. Division of Public Health, Women's and Children's Health Section), the N.C. Office of Minority Health and Health Disparities (N.C. Department of Health and Human Services), and N.C. Child have established a partnership (#impactEQUITYNC) to develop, test, and disseminate a tool to empower public health agencies and communities to evaluate and proactively address the health implications of state and local policies, practices, and programs. Access the Health Equity Impact Assessment (HEIA) Tool. For more information, contact through email. The Women's Health Branch develops and promotes programs and services that protect the health and well-being of infants and of women during their child-bearing years. The goal is to improve the overall health of women, reduce infant sickness and death, and strengthen families and communities. The Women's Health Branch also offers guidance, consultation and training for professionals who provide women's health services. Local health departments and other community agencies serving each of the 100 counties in North Carolina provide a variety of these women’s health services, including family planning, prenatal care, flu shots and other women's immunizations, and pregnancy care management. For more information on the services near you, contact your local health department. The Women's Health Branch is part of the Women’s and Children’s Health Section of the North Carolina Division of Public Health.